Tomorrow marks my three-month milestone living in Thailand. As I pack my bags for my visa run to Vietnam, I consider my time living here, especially being a the first outside of Maryland, to have been a success thus far. The experience has already been life-changing and I am looking forward to all that is in store for the next five months! My Thai is okay, but has a very long way to go (communication has actually been amazing, even with the minimal Thai that I do know) and will improve with more time and perhaps another level Thai class. 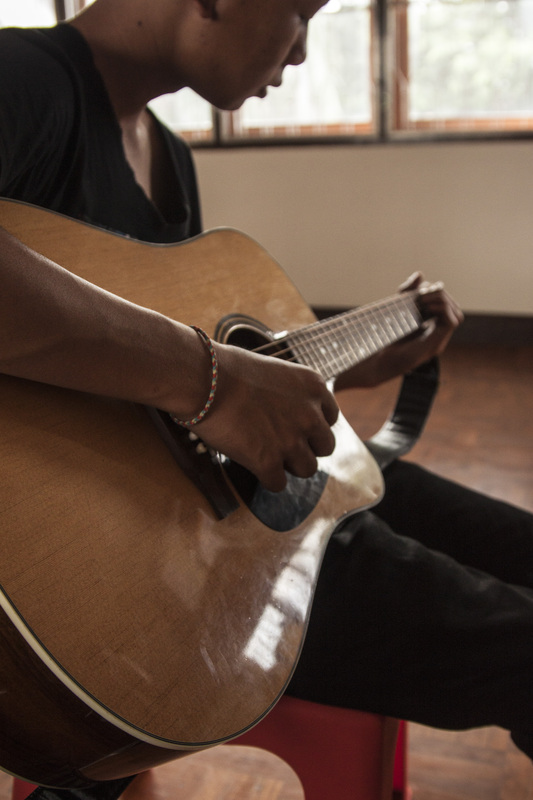 Just in the past two weeks, I have started giving one-on-one guitar lessons, and I can tell that the communication barrier that existed even just a few weeks ago has fallen. After performing two shows in Chiang Mai, it feels great to start teaching and hopefully inspire the kids here at the center. 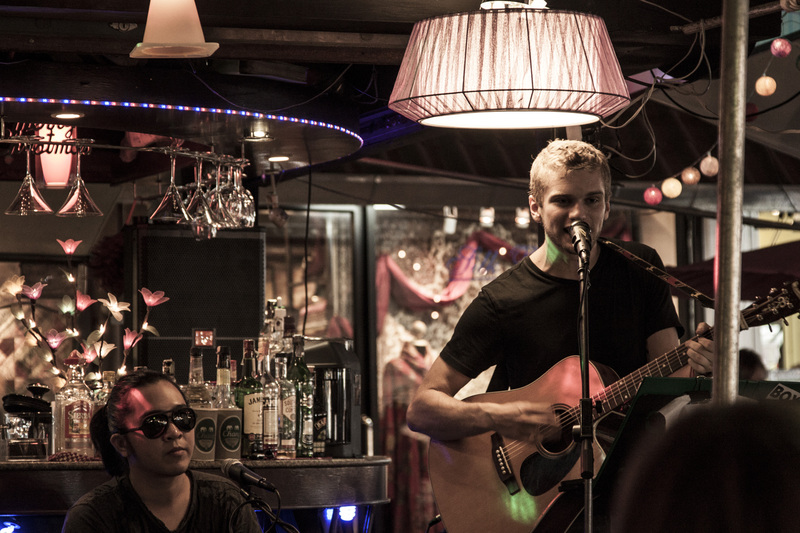 First Chiang Mai performance! I even had a drummer sit in. 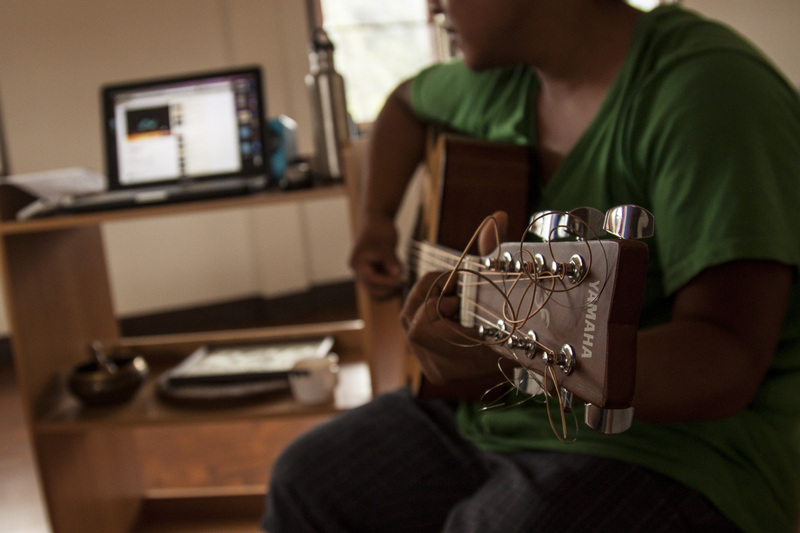 With communication now not as much of an issue, teaching guitar has minimal challenges. Though I’ve never kept a beat in another language before, nung, song, saam, and sii just seems natural to use these days. I expected a few boys would show some interest in guitar, but to see many of the boys’ curiosity and smiles peak during these lessons has blown me away and made teaching music incredibly rewarding. When I show a new chord or even twiddle on a new tune I’m working on, I see their attention so focused and an eagerness to learn growing inside them. After teaching the kids a new riff a new riff, I’ll see the kids playing around the center, creeping their eyes up to meet mine for a look of approval, just as I know I did when I was first starting out. That validation in life is so important to us all, and these kids are like any other in the world, wanting the same loving connections. This is way more than just learning music and I know our boys are benefitting. I use my computer to show the boys chord charts and songs that we are learning. They love to challenge me to learn their latest favorite Thai songs! Yesterday, I was teaching a lesson to two new boys at the center, one of which had never touched the guitar before, and I shocked at the speed at which they both were picking up the material I was teaching. From chord names to that “Smoke on the Water” riff we all learned when starting to play, they were doing it all. I was so impressed and have never seen bigger smiles or laughs from these kids than I did during these lessons.Those smiles give me so much motivation to continue using music and whatever means to help these boys see and reach their fullest potential. In addition to giving guitar lessons and taking Thai language classes over the past few months, myself and many other dedicated individuals at Urban Light and Love 146 have been working on a study evaluating the levels of male exploitation in the Chiang Mai area. 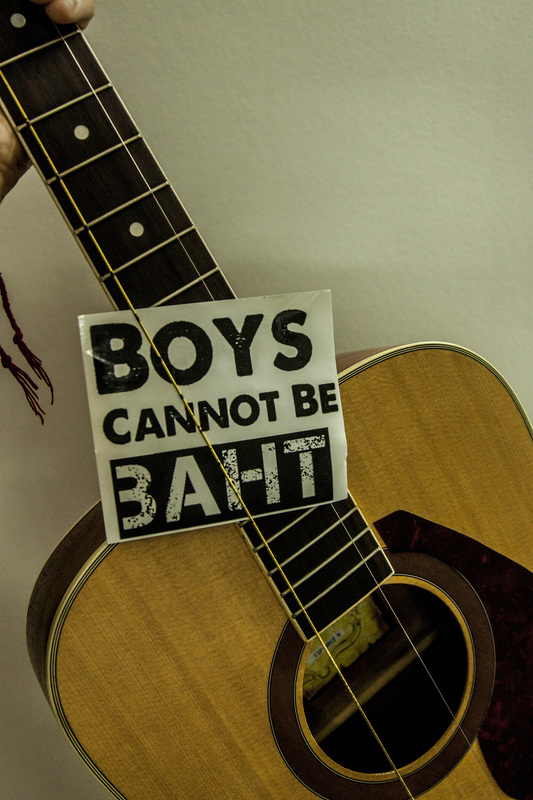 From massage parlors to go-go bars, I have seen more than a fair share of the problems that many young teenage boys and men are facing in Chiang Mai, and the needs they all share. What’s more frustrating about the situation is that isn’t being talked about; from barely scratching the surface of the NGO world to an almost complete lack of acknowledgment from government watch groups, public knowledge is understandably low. Fifty-one boys and young men were interviewed for the study, and staying connected with all of the amazing people we had the opportunity to meet during these interviews is an obligation we must fulfill. The boys’ resilience is inspiring, but their situation can be so desperate at times. Expanding Urban LIght’s outreach efforts is something I am very passionate about doing for the remaining time I am in Thailand, especially after seeing some many of these kids at their places of employment and hearing their stories. Keeping the connections we made strong will be essential for growing Urban Light’s impact in helping more exploited young men in Chiang Mai. I look forward to teaching many guitar and English lessons to all of these kids who are eager to learn, and perhaps even bringing in other trusted musicians to help out along the way. I was so encouraged by my experience teaching guitar yesterday that I knew I would like to purchase more instruments for the UL center to expand the guitar lesson program into a more rounded music program. I’m calling it the The Urban Light Music Project. I am setting an ambitious goal to raise $1000 over the next few weeks to bring this project to fruition. Yesterday, two boys were playing separate guitar parts while I drummed on my guitar case, and the looks on their faces were amazing! The boys couldn’t believe what they were doing—- MAKING MUSIC! I forgot what it felt like to play something that sounded remotely close to what was coming out of my speakers, but I instantly remembered after seeing their smiles and looks of overwhelming enjoyment. Other boys have expressed interest in drums/percussion, which is also something I would like to purchase with these funds. We currently have one functioning guitar in the center and we could ideally add two more with funds raised for this project. In addition to buying the instruments, proper cases will also be purchased so that the instruments will last for a long time (something the current guitars in our center didn’t have). In addition to teaching the kids how to play guitar, drums, and whatever else we come up with, I will also teach basics of guitar care, including changing strings and other maintenance. 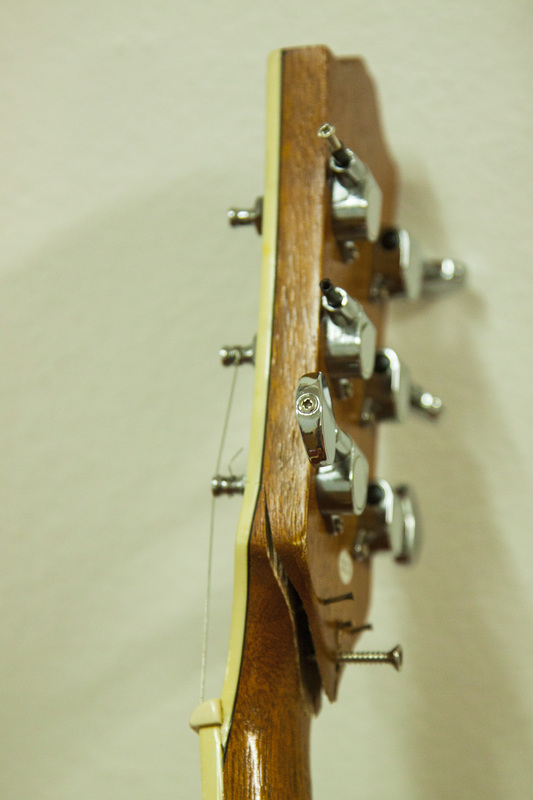 Guitar neck held together with some screws. This guitar isn’t playable and needs replaced. I am simultaneously inspired to raise funds for expanding our outreach efforts, especially after just completing the research study last week. It costs Urban Light roughly $10US each time we do outreach, which can really add up, especially if there are 5+ bars or other establishments we are connecting with a week. Any funds left over from the purchase of guitars and small drums, will go towards our outreach efforts. Bags are packed and I am headed to Vietnam, let’s see what we can all do COLLECTIVELY to make this project come to fruition during my remaining months in Thailand! I will be gone for twelve days and hope most of the headway can be made during that time. Thanks for all of your continued support, and I look forward to updating everyone on this project! Every $1, $5, and $10 donation adds up, and I encourage anyone to contribute, even at these levels. The amount we can do with $10 in Thailand is amazing and truly makes a difference. This entry was posted in Music, Urban Light by ejglotfelty. Bookmark the permalink. Great post mate. And awesome project! Wish I was still there seeing the difference you are making in boys lives through the way you are uniquely gifted! Love the commitment to keep up with relationships and connections made through the research project! Be encouraged in your efforts mate! Miss you all heaps – life is pretty boring here! LOL! Great to hear from you! We are missing you at the center and trying to get things together. This month has been crazy, but productive! I just got back from Vietnam and was so happy to see your comment =) Im sure Australia is a wild change of life from here in Thailand. Take Care!